This instalment of our celebrating votes for women series takes us on a journey through the 1970s and 80s from the advent of the small scientific desktop computers, revolutionising the way we analysed data, to the first cases of “mad cow disease” being investigated at the Central Veterinary Laboratory. Despite a career spanning four decades within the Poultry Department at the Central Veterinary Laboratory in Weybridge, sadly very few records of Lorna Timms’ work remain. A literature search on PubMed reveals that she was a prolific scientist, having authored over 80 scientific papers during her career. From an early 1964 paper entitled “Observations on the incidence and significance of Haemophilus gallinarum in outbreaks of respiratory disease among poultry in Great Britain”, Lorna extensively published on the topic of Arizona infection in turkeys in GB in the early 70s, on the influence of diet on deformities in broilers in the 80s and on Salmonella enteritidis in chickens in early 90s. Lorna’s contribution to poultry health must have been truly note-worthy as she was made recipient of the MAFF Centenary Silver Medal in 1989 and Officer of the British Empire in 1990. I first met Nancy when I was interviewed for my first job as a statistician straight out of university. Nancy and the other 3 board members asked some tricky questions. That interview was in London in 1978. I must have answered the questions okay as I started work in September that year. Small scientific desktop computer (Hewlett-Packard series 80) of the type Nancy and her team would have used in the 80s to analyse data (Creative Commons: computermuseum.informatik.uni-stuttgart.de/dev/hp85/). Nancy headed the statistics department (4 of us) in the Epidemiology Department of the Central Veterinary Laboratory in Weybridge. Prior to my arrival, Nancy was working single handily to advise on the design of all the veterinary experiments, as well as analyse them. 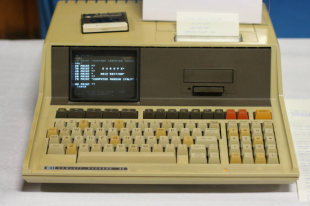 This was in the days before modern computers. There was one computer (for the whole of the epidemiology unit) though this changed when Nancy purchased a couple of what you could call personal computers from Hewlett Packard- about 25cmx25cm with a 5 cm square screen. There were no ‘apps’. For each statistical analysis we had to write all the code and check it. Still, probably state of the art at the time. Nancy’s role in the Lab was key to ensuring good science, by ensuring that enough animals were included to make scientifically valid claims/conclusions when the trial was published. 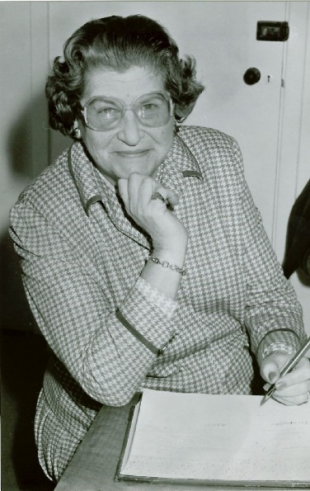 Nancy was co-author on hundreds of publications. Outside of work Nancy was a keen supporter of the World Wildlife Fund. I had a wonderful 8 years working with Nancy. She was an excellent manager and we were a very happy team. She retired in 1985/6. Nancy Hebert was involved in many varied projects during her time at CVL from more methodological pursuits (see publication above) to Brucella abortus variants via Newcastle disease vaccines. A non-exhaustive list of her publications can be found on the Research Gate website. 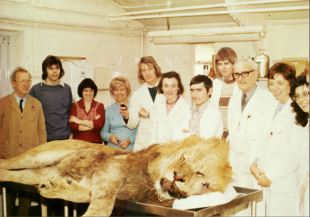 One of Janet’s (center) most memorable post-mortem, a lion circa 1978 (photo courtesy of Michael Elliot, APHA). Janet started working at the Newcastle veterinary investigation center in the late 70s. She retired around 2006, after carrying out 30 years or so of veterinary pathology within the agency. 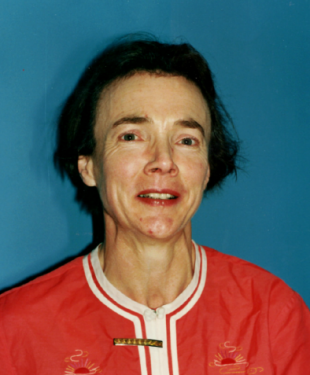 Janet was one of the original team of Bovine Spongiform Encephalopathy (BSE) histology readers, helping to determine the size of the BSE epidemic in the late 80s. I had studied the sheep disease of scrapie for a long time. It was a pathological mystery – an infectious condition but no microorganism could be isolated. In particular, the disease could be transmitted in tissue extracts that did not contain nucleic acid. The infectious agent was named a prion. In 1986 vets in Devon and Cornwall described a new condition affecting dairy cows. They had nervous signs including staggering, falling and bizarre behaviour – hence the name Mad Cow Disease. A novel disease in domestic animals was interesting but when the pathologists at the Central Veterinary Laboratory, Weybridge reported that the brain lesions resembled those of scrapie excitement grew. The incidence of BSE increased dramatically and it was found across the country in dairy and beef animals of all breeds. The source was identified as contaminated feed – hence more dairy herds were affected. It was concluded that scrapie-infected sheep brains had been used in cattle feed. As with scrapie in sheep, there was no test for the disease in the live animal. The only way to confirm the diagnosis was to examine particular sections of the brain after slaughter. I was one of the vets trained in the diagnosis of BSE. At Newcastle we got heads from suspected cases and extracted the brain. Later, a method was devised for extracting the brain stem at the place of slaughter. Processing of brain tissue and preparation of histological slides increased to an industrial scale by the early 1990s. I examined dozens of brain sections per week. Janet Devoy- Date unknown (photo courtesy of Michael Elliot, APHA). ingredients for animal feed were scrutinised. The incidence dropped rapidly after these controls were enforced. BSE and vCJD have occurred in other countries but only in small numbers. It remains a mystery why it was such an epidemic in Britain. On a personal note, when I had surgery a few years ago I was asked about exposure to prion diseases. When I admitted to a cut from a contaminated brain knife I was considered as “unclean”. I was the last on the list for surgery and I was told that all the instruments used on me would have to be destroyed because there was no sure way of decontaminating them. The incubation period for prion diseases can be decades but I have not started twitching yet. Jane Clarke was a government Veterinary Officer with a career spanning five decades. She demonstrated an immense interest in, and love of, animals from an early age. Pet cats would be dressed in dolls clothes and wheeled around in prams and lifeless amphibians and rodents that were found would be taken home and studied to understand their anatomy. She attended the village school in Gillingham before her parents moved to Beccles and then Bungay where she later joined St. Mary's House, Earsham Street. After completing A-levels in Physics, Chemistry, Botany and Zoology, Jane joined the University of Edinburgh where she gained her bachelor's degree in Veterinary Medicine and Surgery (BVM&S) in 1972. 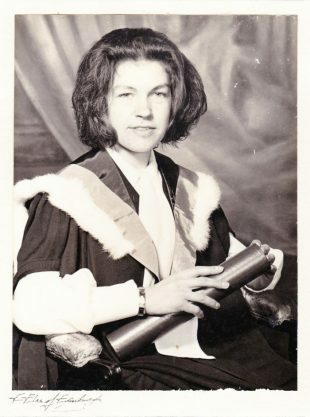 Jane Clarke at her graduation from the University of Edinburgh in 1975. Upon leaving university, Jane married and worked in practice for Mclintocks in Northampton. Missing academia, she returned to Edinburgh to pursue a master's degree in Tropical Veterinary Medicine. Her first child was born a few months before she graduated, in 1975. Leaving university for a second time, Jane again worked briefly in practice. This time for Mclintocks in Norwich (of not relation to the former mentioned practice), which later became the Chapelfield Veterinary Practice. It was whilst she was there that she was offered a position with the Ministry of Agriculture (MAFF), as it was then known, in the late 1970s, where she stayed until her retirement. Jane's love of studying continued and she gained further relevant qualifications whilst working as well as contributing to the teaching of veterinary work. She was a guest lecturer at the University of Cambridge where she presented to the students at the Cambridge Veterinary School. Despite the nature of her work and the great deal of time spent on farms, Jane maintained her sense of style. Earrings and lipstick always accompanied her overalls and wellington boots but she would never stand back and let a man do a job she was perfectly capable of doing herself. Despite her petite frame she was very physically strong which complemented her determined nature and hardworking work ethic. After walking through a slaughter house full of ducks, Jane's career came close to a tragic end. She developed psittacosis caused by the bacterium Chlamydia psittaci. Rarely having missed a day’s work during her career, Jane was extremely unwell, and lucky to recover after doctors were unable to identify the illness. It was only when news of her ill health spread through the community that it was suggested by a slaughterhouse worker that it may be psittacosis and she was then able to receive the correct treatment. Jane's time with MAFF covered the BSE period. Initially, this meant being called out to cases of sick cows at a time when nobody yet knew precisely what was wrong. This was difficult and dangerous work and in those days Veterinary Officers were on call with no other out-of-hours support, so Jane would have to attend farms, make an assessment and euthanize large animals that were far from docile on her own. Jane never baulked at this and always went about things in totally professional and business-like manner. A notable example of her dedication and expertise is when Jane suspected a case of swine fever in August, 2000. Due to collect her daughter from Heathrow, returning with all her belongings after two years working abroad, Jane called to ask if she would mind if she cancelled. Appreciating the urgency of the matter if her suspicions were correct, Jane wanted to immediately take the samples to the lab rather than have them sent. Her suspicions proved correct and it marked the start of the first UK outbreak of swine fever for fourteen years. No job was too much effort for Jane and throughout her long career she frequently worked late in the evenings and at weekends whenever required. By the time of her retirement, Jane was referred to as Miss Marple by some of her colleagues as she always got to the bottom of a case. I met Jane Clarke in January 1997 when I joined MAFF as an animal health officer. I was immediately impressed by, not only how knowledgeable, but how helpful and kind she was. She was always willing to help out a complete novice. Over the years my respect for Jane grew and grew. She was very thorough in her approach to her work and everybody knew that her opinion was one that could be completely relied upon. Jane was an expert in many areas, she was passionate about animal welfare and did not shy away from giving evidence in court when required. She knew the poultry industry inside out and would later become a lead on the very technical and difficult Animal By-products Order work. Jane was extremely glamourous and her small frame and feminine appearance hid a core of pure steel. If I had to sum up Jane it would be in two words : GIRL POWER! Jane was extremely dedicated to not only the APHA (as it became) but to the community she served. It was not unusual to find she had been sending e-mails at midnight and working through the weekends, helping people negotiate the minefield of animal by-products. It was typical of Jane’s dedication that she worked beyond the retirement age of 65 and terribly unfair that she only got to enjoy one year of retirement. In true Jane fashion though, that year was spent learning new skills, this time building, and she had begun a total renovation of her home. Jane was not only held in high esteem by her colleagues but throughout the farming industry. She had a real gift of being able to communicate to and building relationships with farmers who respected her depth of knowledge and sensible approach. Jane’s knowledge and kindness are missed by friends, colleagues and stakeholders alike. Michael Elliott (APHA), Peter Jones, Tracy Warnes (APHA), Nannette Palmer (APHA), Anita Amure.